As often the case with Russian weaponry, derivatives and/or certain export versions of the Su-27 have been given a new designation. This section about the Su-27 will discuss the basic Su-27 and its development. The history, variant, operator, specification and armament lists will however include all variants including those with new designations to give a good overview of the Flanker family. 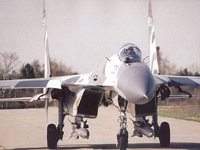 Type specific information, photos, videos and links of the Su-30/33/34/35/37 can be found in seperate dedicated sections to which you will find links in this section as well as on the aircraft directory main page. 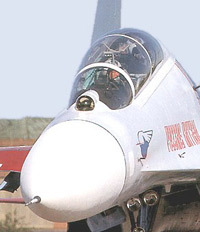 The Su-27 was designed by Sukhoi OKB as a heavy fighter for the Soviet Air Force (Voenno-Vozdushmiy Sily - VVS) and National (Homeland) Air Defense Forces (Protivo-Vozdushnoi Oborony - PVO) to regain air superiority over the F-15 Eagle operated by the US Air Force. In fact, the requirements were based on the performance of the F-15 adding ten percent. The Sukhoi design fulfilled the requirements and beyond. 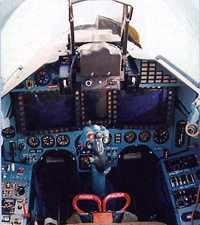 The Su-27 is often proclaimed the best and most successful Russian fighter of the Cold War era. After the end of the Cold War and USSR, the Sukhoi OKB (often in cooperation with the KnAAPO plant) developed various advanced variants aimed at prospective foreign customers. The aircraft were marketed at international air shows, putting up superb aerobatic displays. The aircraft performance both on paper as in aerobatic displays has stunned many enthusiasts and experts alike all over the world. Also, the Flanker has proven its air superiority in combat during several African wars. The Su-27 and its derivatives are today some of the most popular fighters to be discussed by both aviation enthusiasts and experts. Based on the Su-35 (Su-27BM), the Su-27SM2 upgrade is on offer to the Russian Air Force for the second phase of its Su-27 mid-life upgrade program. The Su-27SM2 upgrade will give Russia's existing Su-27s a similar avionics and weapons suite as offered on the Su-35 (Su-27BM). The Russian Air Force has expressed interest in the Su-35, but it remains to be seen whether this will include new air frames or be limited to the Su-27SM2 upgrade. For more information regarding the various upgrades and developments, see the variant overview. AFM (2007-1), Air Forces Monthly #226, January 2007, p. 18, Key Publishing, UK. Butowski, Piotr (2007). The Next Generation in Combat Aircraft, European Edition, Vol.8 No.5, October-November 2007, pp.22-25, Ian Allan Publishing, UK. Butowski, Piotr (2008). Sukhoi's Latest 'Flanker', Combat Aircraft, European Edition, Vol.9, No.3, pp. 52-55, Ian Allan Publishing Ltd, UK.